Kitchen trends come and go, but a white kitchen stands the test of time. It’s clean, fresh and adds resale value because it’s a blank slate for any new buyer to customize. White kitchens have a grand history. In the 1920s and 30s, white was the only color offered by manufacturers. White was associated with sanitation and health. Since it began keeping records, the Association of Home Appliance Manufacturers reports that white appliances have consistently outsold all other colors. White also regularly tops the list of the most popular kitchen colors in the National Kitchen and Bath Association’s annual survey. As the brightest color, it makes even small kitchens seem spacious. It’s a great color to build upon with light fixtures, cabinet hardware, and tile accents. It’s easy to change elements around it whenever the mood strikes. It is applicable to traditional, contemporary, and transitional design styles. Because it’s a standard color for any manufacturer, white cabinets, tile, counters, faucets, sinks, and appliances are usually cheaper. All white kitchens can still have options. Appliances are offered in variations of white. Decorative white overlay panels can even cover existing stainless steel appliances. Countertops are available in a wide selection of white granite, quartz or marble. Some modern designers are even incorporating white concrete into their kitchen visions. Glass shelves or light colored wood can provide a little contrast without sacrificing the monochromatic theme, too. To keep a white kitchen from appearing boring, add interesting details like decorative bowls or baskets, detailed trim, and knick-knacks with character. Perhaps paint the ceiling or the kitchen island with a bold contrast color. Most of all, keep it clean because it is certainly easier to see smudges, spills, and splashes against a white backdrop. Direct sunlight may discolor white cabinetry. Scratches, worn corners, and delaminating cabinet doors are also more visible when the cabinets are white. 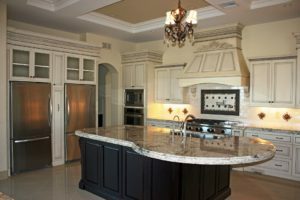 Since cheaper white cabinetry will age less gracefully than higher-quality products, choose Cornerstone Cabinet Company manufacturers like Oakcraft and Shiloh. If installed correctly, white kitchens can stay brilliant just as long as other finishes and colors. For ageless beauty, white all right!